Lovely and warm, with a hint of sophistication. Sound like you? 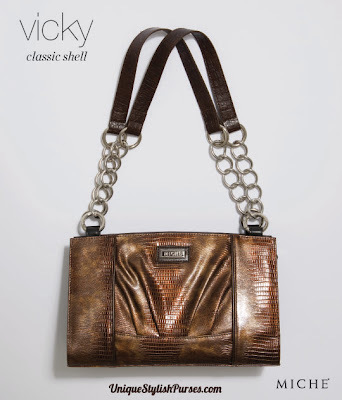 This also perfectly describes the delightful Vicky Shell for Classic Miche Bags. High gloss lizard print faux leather in glimmering bronze is beautifully accentuated by soft front pleats and dark brown piping detail.